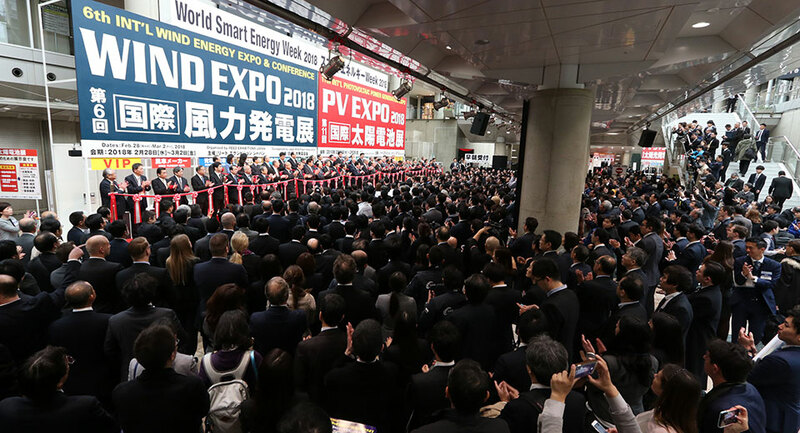 Last week I had the opportunity to attend the 3rd International Biomass Expo in Tokyo, Japan’s largest show for biomass power generation, held in the framework of the World Smart Energy Week and organized by Reedexpo. This large business event hosted 1,580 exhibitors covering a wide range of products and technologies including renewable power generation, renewable heating, energy storage, energy saving, distribution and transmission. 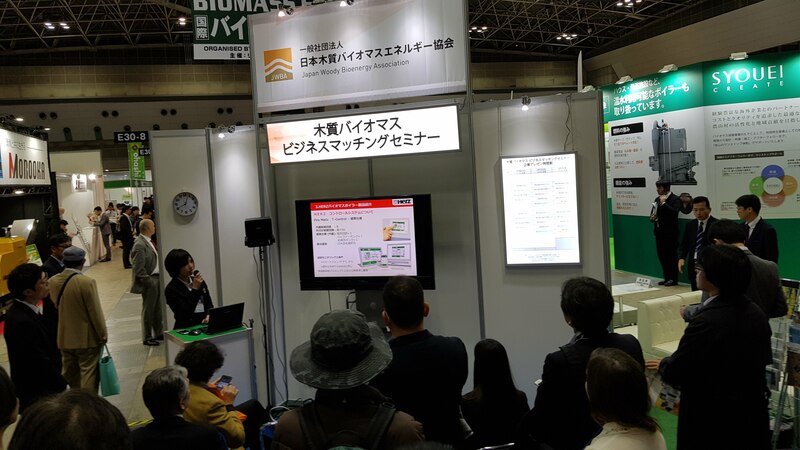 During the three days of the event, I had the opportunity to talk to many exhibitors and visitors about the trends in the sector and the opportunities existing today for bioenergy in Japan. The country has a large forest cover and there is a significant biomass potential. Nationwide about 5 million m3 of forest exist in Japan and today power plants consume 100,000 tons of biomass annually, which represents 1/1,000 of the total volume of wood and only 1/16 of annual growth volume of forest stocks. There are many potential locations for the development of biomass projects across Japan, however, as the territory is mainly mountainous, the mobilization of this biomass is often challenging, due to logistical constraints such as high slopes and lack of roads accessible to big forestry machines. The Japanese Woody Bioenergy Association was one of the co-organizers of the International Biomass Expo. Partly funded by the Forest Agency, the association promotes the energy use of biomass residues and by-products from the domestic forestry industries. The stand of the association was always crowded, and people stopped at the presenter’s area to follow the live presentations which were offered almost continuously. Dr. Hirouki Akiba gave us a short insight into the present Japanese biomass context. The current incentive scheme will run at least until 2019, and it promotes the utilization of “unused” biomass, with a feed-in tariff of 40¥ /kWh for 20 years, for power generation in plants up to 2 MWe capacity. While the market for large-scale biomass plants (>10 MWe) can be served by several local providers with efficient and reliable domestic technologies, fewer solutions are available for small-scale plants. European providers which historically have invested for decades in research and development for small-scale biomass power generation, may then offer viable options to project developers to benefit from this incentive scheme. Indeed, several of such companies were presenting their products in the exhibition, one of this is the Italian RM Group. 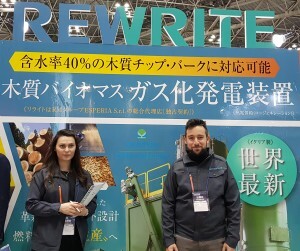 Our first experience in Japan was two years ago at the Renewable Energy Fair in Yokohama, says Martina Andreoni, Marketing Manager of RM Group. We had no clear expectations by that time, but since the beginning, we received lots of interest from Japanese visitors in our small-scale gasification systems, and we went back to Italy with many ideas and many contacts to follow up to. 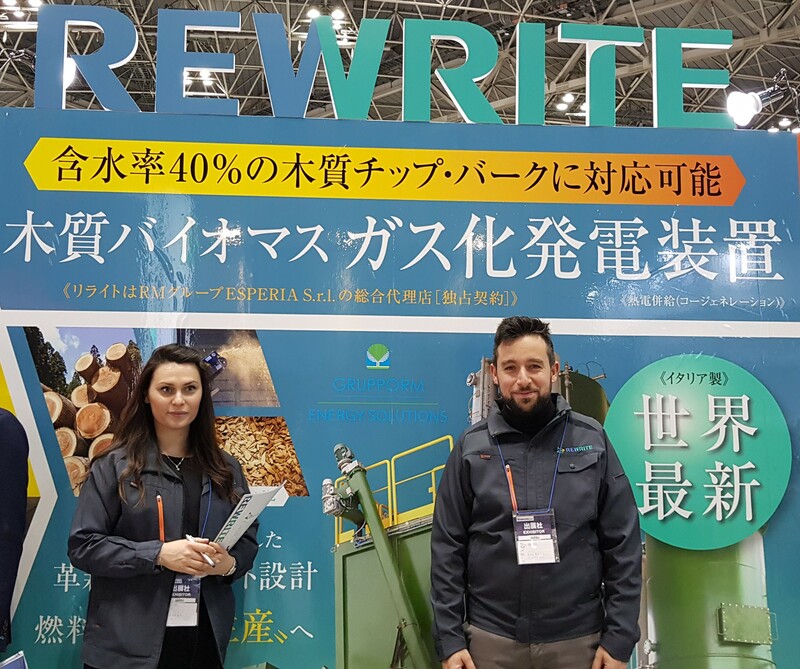 In the last year, we have established a local partnership and today here at the International Biomass Expo, together with our partner Rewrite inc., we can show our first commissioned project. The plant is a 50kWe biomass gasifier in Iwakuni city and it will run with unused forest wood from local suppliers, explains Enrico Righeschi, engineer at RM Group. It is now being shipped and will start operations this spring. We are also building a second plant, 249 kWe, which will be delivered later in 2018. 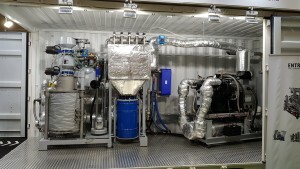 Another example is the German company Entrade, showcasing its modular containerized downdraft fixed bed biomass gasifier at Int’l Biomass Expo. The company inaugurated its first plant in Fukushima in March 2017. The mobile plant has a capacity of 50 kWe and 120 kWth and runs with pellets and woodchips. Moritz Husmann, lead engineer at Entrade, explained that ten years ago when the feed-in tariffs for bioenergy were high in several European countries, small-scale gasification technologies were not completely ready yet, but thanks to that market pull and to the continuous technological improvement, today’s plants are technologically mature and commercially viable, and Japan is well positioned now to benefit from these technologies, with the current incentive scheme. Holzenergie, is another German manufacturer of biomass gasification plants exhibiting at International Biomass Expo: “This is the fourth time we come to Japan, it is an interesting country and we are confident we can make a good business here at International Biomass Expo”, he says. 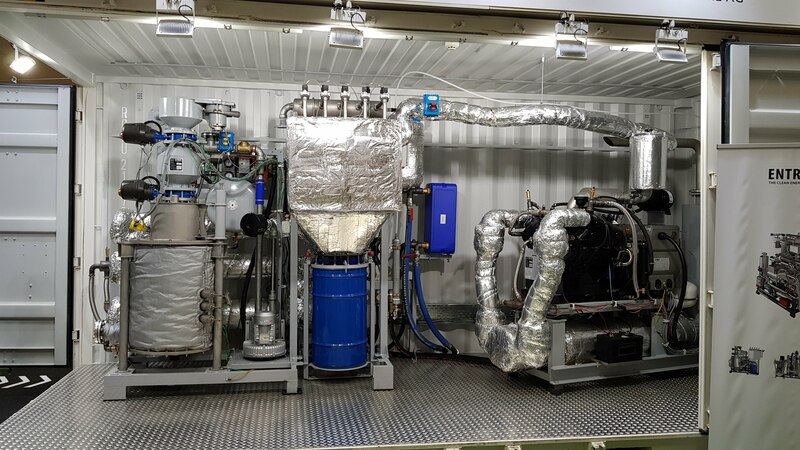 Despite the recent interest in small-scale biomass power plants, there is room also for heating and cooling, applications. We are in Japan since 2004, we mainly provide heating and cogeneration plants here, for schools and for SPAs, says Lukas Schirnhofer, president of Austrian Polytechnik . You have to invest a lot of time to build the necessary relationship and to establish the right conditions but Japan it is a good market. In addition to technology providers and operators and for small-scale electricity production from solid biomass, biogas was another sector which was extensively presented at the Expo and although the fair mainly targets technology providers, researchers and academics were also present massively among the visitors and some of them talked to us about their local activities and results, which we will share in the next post. (to be continued).